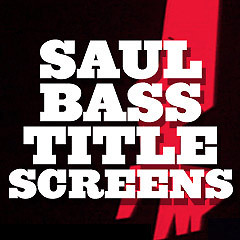 Movie Title Screens - Saul Bass Films: Title screens are the initial titles, usually projected at the beginning of a film, and following the logos of the film studio. They are often an ignored aspect of films, although they reflect the time period or era of the film, the mood or design of the film, and much more. The famed graphic designer Saul Bass made his most lasting impact on the movies, with his designs for movie title screens. The normal and staid method for film credits was to perfunctorily present names and titles on cards, or against an unmoving backdrop. He was known as the man who invented the opening credit sequence - he incorporated the title screen into the film itself with striking images that were often animated. He transformed and elevated static title screens into stylized, moving works of art, first most dramatically with his jagged, twisted and deconstructed forearm that moved (a symbol of heroin addiction) for The Man With the Golden Arm (1955). Bass' first innovative credit sequence was for Otto Preminger's Carmen Jones (1954), using an animated flaming rose. He was able to select one emblematic, identifying image which symbolized each movie, and incorporate it into the title screen. His designer wife Nina Saxon also had more than 100 titles to her credit, while Saul Bass produced about 60 title screens (some uncredited) - with some of them co-created with her. Bass' most memorable creations were the segmented deconstructed body for Anatomy of a Murder (1959), the aerial camera swoop across Manhattan before a zoom-in on a schoolyard in West Side Story (1961), and a slinky black alley cat walking through the titles of Walk on the Wild Side (1962). His most daring innovation was a 7-minute recreation of the story of Around the World in 80 Days (1956) - an end-credit sequence. Other memorable works included his horizontal lines creations for Hitchcock's films, including North by Northwest (1959) with its facades of skyscrapers, the slashing vertical bars (symbolizing schizophrenia) for Psycho (1960), and Vertigo (1958) with its hypnotic vortex of blood-red spinning spirals, and the LED-inspired opening of Ocean's Eleven (1960). In his later years, he produced the titles for Martin Scorsese's Goodfellas (1990), Cape Fear (1991), The Age of Innocence (1993) (with blossoming rose petals) and Casino (1995) - with the striking image of the main character blasted by a car bomb through a Las Vegas Strip casino's neon into the fiery inferno of hell.